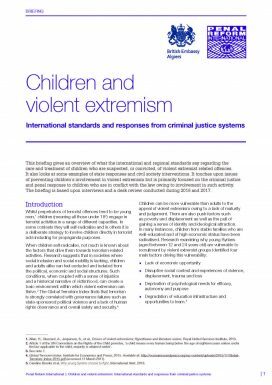 This briefing gives an overview of what the international and regional standards say regarding the care and treatment of children who are suspected, or convicted, of violent extremist related offences. It also looks at some examples of state responses and civil society interventions. It touches upon issues of preventing children’s involvement in violent extremism but is primarily focused on the criminal justice and penal response to children who are in conflict with the law owing to involvement in such activity. Key points of the briefing were translated into Albanian, BCS (Bosnian/Croatian/Serbian) and Macedonian for the 2017 US Department of Justice’s Symposium on Efforts to Address Prison Radicalization in the Balkans.